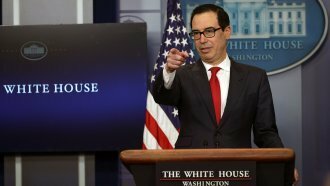 U.S. Treasury Secretary Steven Mnuchin is defending remarks he made Wednesday about how a weaker dollar would benefit the U.S.
Mnuchin told reporters at the World Economic Forum in Davos on Thursday that his comment was "balanced and consistent." He said: "We are not concerned with where the dollar is in the short term." The value of the dollar dropped sharply not long after Mnuchin's statement Wednesday. The strength of U.S. currency plays a key role in international trade — which is an important talking point for the Trump administration in Davos. A weaker U.S. dollar makes American goods cheaper on the world market and could boost U.S. exports. Mnuchin's remarks echo previous statements made by President Donald Trump, who has said the U.S. dollar was "too strong" and that American companies couldn't compete because of it.